“Beasts of the Southern Wild” is a film that I have been wanting to catch for quite some time now. Seriously, I have been yearning to finally catch this film and just the other day, I finally did. In a setting that was so spectacular that it added to the experience exponentially. I had the privilege of viewing “Beasts of the Southern Wild” in the Prospect Park band shell with a live orchestra who scored the movie while it was being played. Best part about it, the actress Quvenzhané Wallis, who plays Hushpuppy was there, in person!, to conduct the orchestra and thank the audience for being there. It was incredible. The lighting. The music. The massive amount of people who were all there to see this great film and listen to this great score. I cannot express how happy it makes me to have seen this film in that setting. “Beasts of the Southern Wild” stars Quvenzhané Wallis as Hushpuppy a little girl who is struggling to “be the man” that her father Wink, played by Dwight Henry, wants her to be. Yearning for a maternal figure while creating the tough skin she needs to survive, Hushpuppy and her father try to survive the flodding that is threatening their survival as they live in “The Bathtub” a fictional piece of land that is outside the levies that have been constructed. This land is prone to flooding but the food is plentiful as is the drink compared to the inner dry land, which the viewer is shown glimpses of, which appears stark and sterile compared to “The Bathtub”. Determined to prove that she can hold her own, Hushpuppy enlists the help of several of her compatriots setting off to find herself and stare danger in the face. “Beasts of the Southern Wild” is a beautiful story focusing on the relationship between a daughter and her father in a wolrd where tears cannot be wasted nor are they afforded. This movie was tear-jerkingly beautiful. From the “Beast It!” scene to the last shot of Hushpuppy we see. I am not afraid to admit that there were tears in my eyes for how beautiful this movie was and how great Quvenzhané Wallis was. She enraptured me with her soft spoken sayings and her scowls at her daddy and the other men who thought they had it hard. She looked the part and acted like a girl who needed no man to tell her what needed to be done, even setting fire to a house in protest to the words that her father lashed her with. The music to this movie is excellent as well and appeared to be a mix of Irish jig and Cajun soul. 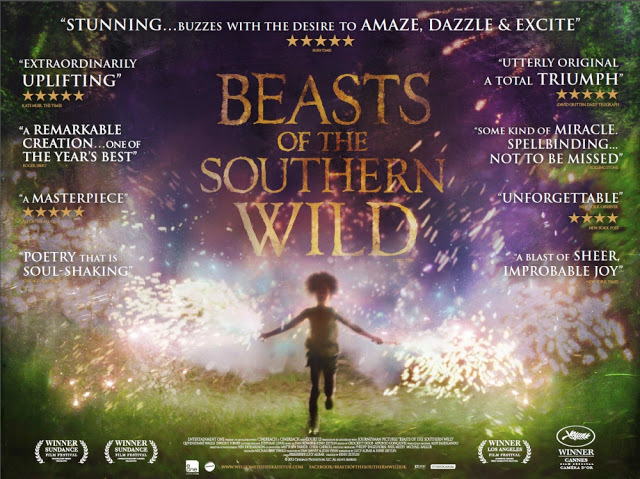 I listen to the main theme for this movie every now and thn and am instantly transported back to the moment when Hushpuppy was running through a field fearlessly carrying two fireworks as they are spouting red flames. The scenes were equally as beautiful and the dialogue kept to a minimum because, well, how many ways can someone say that the world is coming to an end and the flooding is getting worse. Action was important in this movie, action and decision. The choices people made the behaviors people engaged in, were all with a purpose and were all shot wonderfully. If you haven’t seen this phenomenal movie shot by first timer Benh Zeitlin. Then please check it out. It is awe inspiring.